You're expecting a girl and want to add a feminine touch to your baby shower favors. Items that inspire thoughts of your special princess are desired over the standard gender neutral favors. Choose trinkets that celebrate your little girl while delighting your guests. Plenty of pink will ensure there are no questions over the gender of your little bundle of joy. Girls are supposed to be made of sugar and spice and everything nice, according to the old nursery rhyme. Give your guests a favor that celebrates this theme. Dust sugar cookies with cinnamon and pink sugar crystals. Place them inside pink tulle drawstring bags. Attach a small tag with a pink ribbon with the words “sugar and spice” on it. Alternatively, substitute pink wax paper favor envelopes or see-through boxes for the bags. 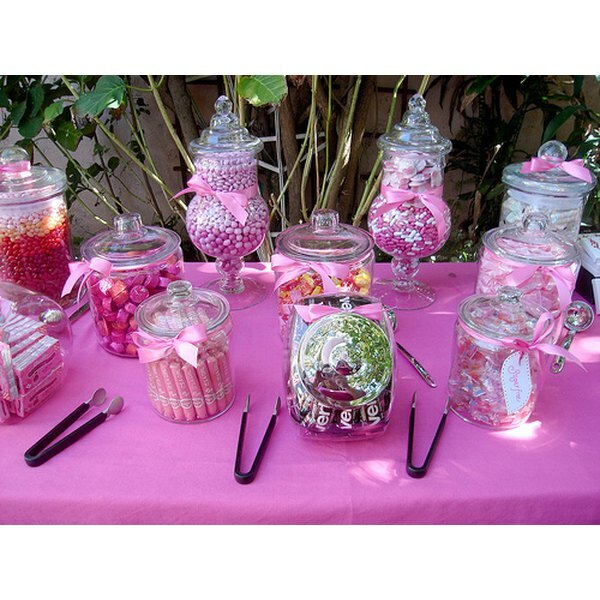 Fill jars with pastel pink candies. Screw on the lid and cut a square of polka-dot pink fabric larger than the lid. Place a pile of spiced potpourri on top the lid and lay the fabric on top. Place a line of hot glue around the rim of the lid and press the fabric into it to seal the potpourri inside. Tie a ribbon around the rim to disguise the glue line. It's no secret your baby is sure to be the princess of the family. Theme your whole shower around princesses and choose favors to match. Make fairy princess wands with clear favor tubes, available at party stores. Fill the tubes with candy or bath salts. Mix pink and white salts or candies. Wrap pink and white ribbon around the tube. Use curling ribbon and leave long tails of curls hanging down the side of the wand. Coat a wooden craft star with glue on all sides. Sprinkle white and pink glitter on all sides and allow to dry. Shake off the excess glitter and glue to the lid of the favor tube to complete the wand. Purchase small princess-style doll dresses. Mix one part white glue to one part water. Dip the dress in the solution and coat thoroughly. Place it around a vase of the same height as the dress. Fluff out the dress so it is open, as though it's being worn. Allow the dress to dry stiff. Place a bouquet of flowers or lollipops in each dress vase. Most girls love to play dress-up, and one day your little girl will, too. Assemble purse favors with items your guests will enjoy. Purchase small pink coin purses. The more ribbon and lace the better, or glue on your own embellishments. Another idea is to purchase pursed-shaped favor boxes in pink and decorate them with lace and pink rhinestones. Fill the purses with candy or beauty items. These include pink lip gloss, pink nail polish and baby powder-scented body talc. Tie a small baby-themed charm to the zipper pull or handle with a pink ribbon. What Kind of Food Do You Serve at a Bridal Shower?